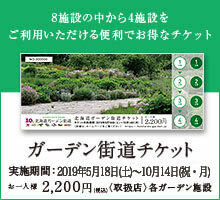 We will discount selling tickets for almost the only public transportation and tourist circulation bus "Fan Fan" that can go to Ueno Farm with a set with Garden Road ticket! From July 11th to October 10th this year, the touristic circulation bus "Fan Fan" over Asahikawa sightseeing spots will start running! ! (1) All-you-can-eat at 800 yen a day! !